Are you looking for a healthy, quick and portable salad to take to work? Look no further! I love this salad and I usually have everything in the house so it is an easy one to make the night before to take to work. Dressing: Olive oil and balsamic vinegar with dried Italian herbs sprinkled in. This salad is packed full of nutrients, anti-oxidants and lean protein. I promise you will truly enjoy this quick and easy salad, try it today! 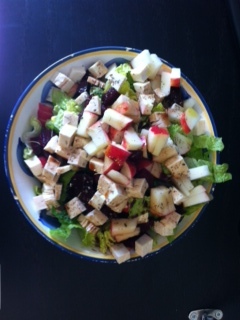 This entry was posted in Be Healthy, Favorite Recipes and tagged Antioxidants, dried cranberries, lean protein, tofu. Bookmark the permalink.